Titling Stencil JNL is an extra bold stencil treatment of R. Hunter Middleton's 'Karnak' (produced in 1936 for Ludlow) and is a companion font to both Bookkeeping JNL and Bookkeeper JNL (a lightweight version of the type design). Middleton based his 'Karnak' family of typefaces on the geometric slab-serif 'Memphis', which was designed in 1929 by Dr. Rudolf Wolf and released originally by the Stempel Type Foundry of Germany. According to Wikipedia, 'Karnak' was named after the Karnak Temple Complex in Egypt, in reference to the fact that early slab serifs were often called "Egyptians" as an exoticism by nineteenth-century type founders." 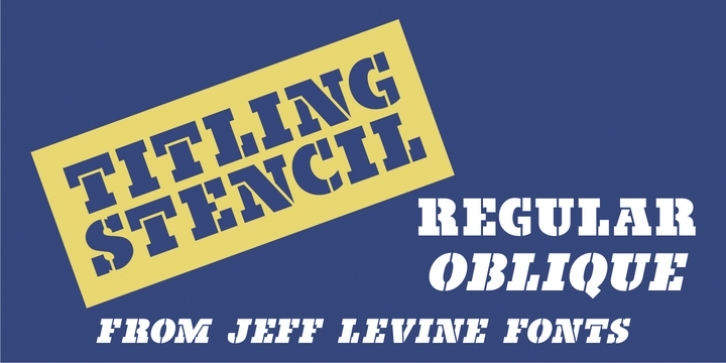 Titling Stencil JNL is available in both regular and oblique versions.